What my weekend would be centred upon..
Yeay! A few hours ago, I got the books I ordered and now I know what to do this weekend hehe..
Yea yeahhh.. I know! These are old books maybe, but still, I haven't read them. Okay, maybe I've watched the movie or something, but all bookworms know, THE BOOK IS ALWAYS BETTER! I've bought.. hmmm, 8 book I think from her and mostly they are movie tie-ins like the books above. Anyway, just a quick advert here. I ordered these book from The Books Galore, an online book rental store. It is managed by a girl I only know only by the name of Zawani and though we haven't met before, she's a pretty great girl and fellow bookworm. We've IMed several times (about books.. what else!) and she's always happy to help whenever you wanna find a book. This is entry mengade sebab feeling as if dah lame tak update.. and yes, these are my 'bedmates' hehe.. wpun sekarang more often than not, I'd rather push them off the bed before I sleep instead of sleeping with them. Ye la, they get the bed the whole day long, I only get it at night whaaaaat :p Maybe jugak because i'm suddenly feeling more adult and dah takmo tido ngan bende² ni dah kot heheh.. So here's the first group yang dipakse 'mandi'..
And here's the second one..
Am I crazy for falling in love? When we're hanging, spending time girl, are we just friends? Is there more, is there more? 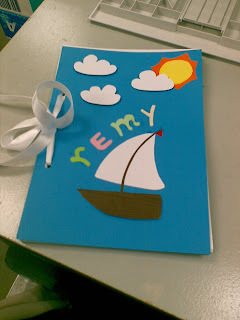 One look at the title and everyone smiles.. tul tak? 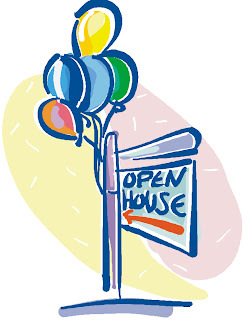 Hehe..
Actually, the reason I'm a bit 'perak' about open houses is that the previous year, I always miss open houses. I'm the type of person who does her puase nam and puase ganti ASAP. Usually after Syawal, I don't have to think of them anymore (pose nam lagi la konpem kan tak yah nak pk pun klau dah bukan Syawal hehe..) But the downside to this is that in my haste to finish it, I forget about the invitations.. and its worse when the invitations come on the day itself la kan.
Then 2 hours later went to Fisya+Apit's open house at their home in Jawi. We had actually planned to go there early, just so we won't get caught up in the afternoon crowd but Sharil had to wait for these contractors to finish their job so in the end we went there at 6pm. Ok la kan, since kak Ana's food pun dah digested by then so bleh la makan kat umah Fisya. Here, I also cari my nasi impit (like I said, some might say its boring, but not me!) and was delighted to find the kuah kacang just like arwah Pah Chu's, with some beef in it :) Didn't plan to eat their mee kuah ketam as I was still full (wpun cam sedap je tengok Sharil makan, kuah dia nye isi byk giler) but Fisya wouldn't hear of it and Ayu dipakse gak makan.. sib baik makan! Sedap woooooo..
Btw, these were both on the same day. I could only attend open houses on Sunday as I still had my class on Saturday. Then that Friday had an open house at En Azman's house in Permatang Pauh. We went there after office hours, tapi dah kul 6 lebey la jugak bertolak dari sini. (Tunggu sorg tu lambat siap.. uhhh, sebut kang kecik ati, terpakse buat tak perasan dia lambat siap haha even when I know, he was just waiting for me to comment on him being late hehe..). Penuh gak la kete Salleh as I went there with him, Ad, Sharil and Ramadhan. Abg Fadzil and family had gone first while we waited for our late friend and there we ate some nasik ayam (sedap), pulut kuning with rendang (paling sedap), bihun sup (tatau la ape rase.. dah kenyang time ni) and some birthday cake (En Azman's daughter was 7 that day). Makanan lain dah tak pasan sbb dah kenyang sgt dah time ni. Dan sungguh tak malu la group from USM ni, kecoh rumah En Azman with us aje. Org tu usik org ni, org ni usik org tu.. gaduh² la like in the postgrad room, mane tak bising.. sib baik la En Azman senyum je ngan kitorg.. wpun dalam hati, Tuhan je yang tahu la kan.
That Sunday plak umah abg Fadzil but 1st I went to Hasz's house. Baru tengah pk² nak makan ape for lunch (Didn't eat yet sbb we planned to go late since Sharil n Lah ade keje and Ad had gone to repair her car) and she called.. rezeki! Her in laws are from Kuala Kangsar and on that day I found out we were related.. on both sides plak tu. Kecik tul dunia ni.. Had some fried macaroni and my usual nasi impit but other things on the menu were nasik goreng and lakse Kuale. Sempat belajar this pudding from her mum.. nnt klau experiment pudding ni jadik, I post it here, k.
Malam tu gi lagi umah abg Fadzil, tolong kak Nor basuh pinggan but had to stay until 11pm sbb ramai sgt la pulak jemputannye. And since tak kenal sgt kawan² diorg ni, Ayu jadik anak dare sunti sembunyi kat dapur haha..
Then Wednesday, the Geotechnical group in the school did their own feast. Tak jadi Ayu puase hari tu heheh.. Abg Fadzil's sister was catering for it and it was superb. Nasik tak kenal but the lauk was yummy. 4 types of kuih (cara berlauk, bengkang keladi, tepung pelita and apetah satu lagi tak ingt) and mee curry. Sejam kitorg duk situ hehe.. So now its back to fasting..
Tapi Ahad ni open house abg Azahar plak. Dunno what he's preparing la tp. Mule tadi not sure to go or not sbb Ad not sure, tp abg Fadzil ajak gi skali with his family, kire jadik le pegi so not fasting lah this Sunday. Then Monday is Sharil's open house. Ingat nak pose jugak sbb nak lawan ngan abg Fadzil kan haha.. tp Sharil tak bg heheh.. Still, since his family's open house until night, kitorg (termasuk la Ad..) ingat puase jugak la. Klau Salleh, Ellie and Iz pun nak pose, lengkap la our rombongan org berpuase ke rumah Sharil haha.. So orang lain, ade lagi nak jemput kitorang to open houses?!?! Sgt ngantuk.. couldn't sleep last night! Actually, I DID sleep but I woke up around 2am and couldn't sleep after that.. tension tak? I really wanted to write about yesterday's MAKAN DAY hehe.. but right now I keep seeing my bed at home. If it was up to me, this morning I would've slept in. Unfortunately, this week is the final week for the Geomatics class and the students have been 'on my back' since Monday. The earliest I get to go home would be at 6pm.. and to top it off, its been raining cats and dogs here in Nibong Tebal so usually my 6 o'clock turns into 7 o'clock. 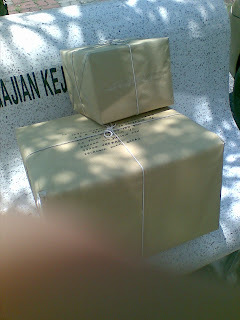 Thank God they have to submit everything today..
Haaaa.. If it was up to me, I would've slept in but since En Taib (the technician for the drawing room) has taken a weeks leave, he had left the drawing room key to Sham.. who then took a leave on Wednsday. Guess who was left with the key on Tuesday? And to a very 'stubborn' door too.. Gile leceh nak bukak, Sham had to give me a 'tutorial' on opening doors on Tuesday.. Buat malu je kang dia ingat kitorang nak harap technician sampai ke bukak pintu pun tak reti! Ishh.. lari topik lagik. If it was up to me, I would've slept in but since I was in possesion of the wretched key, I had to come early to open the room for the students. I just came up from that room, answering their questions on the plotting and bla.. bla.. bla sambil² melayan boring with Zabidi just now. Told Zabidi to go back to his room as he should be there when the students submit their report+fieldbooks+plotting but bile takde kawan nak sembang, mule la ngantuk balik..
Come to think of it, I think I WILL go back in a few minutes.. giler tak tahan ngantuk nih.. Went there on Saturday after sending Remy off to Japan. I was fasting on that day and had a class so we went there after Maghrib. 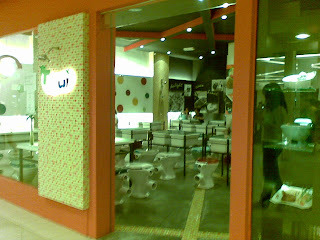 Its just a normal restaurant, the food pun ok laaaa.. tp tmpt makan yang menarik. took some pictures tp low quality ones je la kan sbb just from my phone. This is Salleh explaining to me about the 'hut' we ate in. 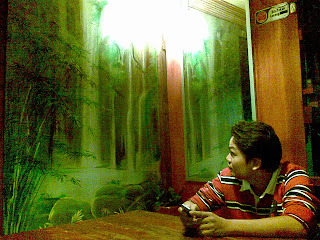 Here's Arip, behind him is actually a very pretty bamboo tree yang suda tidak nampak di dalam gambar ini.. sheesh! And this is the view from the parking lot.. suke! I had a friend in AlMashoor. I'm not that close to her, but I like her. And why the sudden thought of her? Suddenly I remembered this song I liked when I was in standard 6, I think. "We could be in love" by Lea Salonga and Brad Kane. It's a sweet song.. to me la at least but after entering secondary school, none of my friends knew of the song so in time, I forgot about it. Then in form 3, Suhailiza a.k.a Ija was my dormate and one day, outta the blue she asked me about this song. I can't tell you how delighted I was when I knew someone else knew about the song too..
Anda rase di buli apebile..
Parcel yang kecik untuk Mek Maggi a.k.a Nurikhsan Izati yang berisi perishables yang dia nak jugak².. huh.. sib baik kak Zue buat lagi maruku ni..
Parcel yang beso untuk Adi a.k.a Idham Mursyidi yang berisi 'barang berharge'nye.. beserta adiah besday nye sbb dia kate adiah aritu adiah ari raye.. cehhh! While searching for some PhD cartoon to put in our first newsletter, I found this picture. 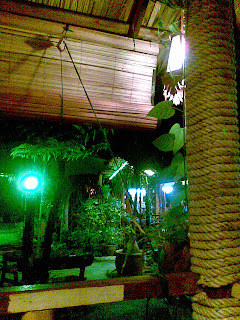 It was taken a few rayas ago at Toroque's house in Tasek Gelugor. So to those who have never seen my two best cousins, here they are :) With their wives jugak.. rasenye this was Toroque's first raya as a husband kot. Sekarang dah nak masuk anak ketiga dah huhu.. It was one of best raya ever :) Even when I had gone to Penang (was staying at Kuale then) with my siblings, sent them to the Penang island before going back to the mainland to be with my buddies. 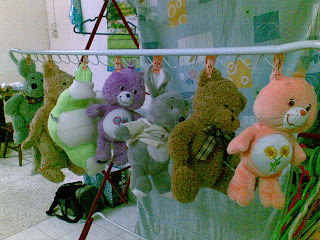 Kenyang sampai ke malam beraye hari tu hehe..
On Monday, Fared had called me while I was still at home. 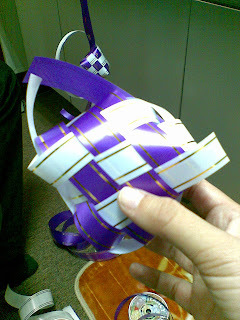 He had to decorate our 'Bilik Jamuan' for the Aidilfitri feast held in our school and wanted to go buy the thingeys for the decorations, thus, my lesson in ketupat making. 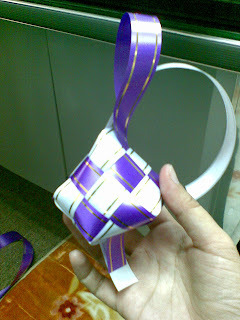 Hehe.. to tell you the truth, the first time I learnt doing the ketupat was with Pak Yang during one raya a few years ago, but I didn't get the hang of it and gave up after a few attempts. Then a few years later, I sorta promised IM I'd go learn about ketupat making with his mother. which of course la according to present circumstances (and things that happened after that), memang Ayu tak pegi la belajar ngan mak cik.. This time, I told Fared, "Akak nak belajar betul².." So mari kite lihat usahe Ayu dalam membuat ketupat ribbon hehe..
Firstly telah di bully oleh Salleh.. "Kak Ayu kene belajar dari asas, belajar dari bawah.. so tugas pertame, gunting ribbon.."
Gunting ribbon pun gunting ribbon laaa..
Then the process of ketupat making.. naik juling mate Ayu. But after a few minutes.. tadaaaa.. Okay la, ni tipu skit sebab yang ni 50% Ayu buat sendiri, another 50% Fared kene ajo step by step. Tapi jadik la kaaannn hehe..
Dan mari kite lihat cubaan kedua Ayu..
Sian Salleh, dia tolong repair dekat 3 ketupat Ayu tp name tak masuk pun dalam blog sebagai pakar buat ketupat so untuk Salleh, mekasih ye tolong repair ketupat akak yg asyik tak jadik je tu heheh.. salute²! Also got this from Ellie. Filled with yummy chocolates yang dah selamat masuk perut and tak sempat diambil gambar nye heheh..
My sister Izati celebrated this raya with her new phone.. ye la, my phone kire dah umor setahun so no longer the newbie in the house la kan. Anyway, she had filled up her phone with a lot of songs (ade la jugak gaye berlagak dia sbb lagu dia banyak kaaannn.. siap gelakkan phone kakak dia yg still using memory card hehe..) Then dia pun berjangkit with Ikram and Iskandar who loves to transfer songs to and fro from their phones to mine. One of the songs she sent to me was a song during my school years (ye ke school years?). A song from Elite entitled Manisnya Senyumanmu. When this song was among the songs on the top of the chart, I didn't actually like it that much, biase² je. Suke tu suke la, but not the minat giler sort of suke. But..
Haha.. tetibe teringat kat Pojie! This happened a few years ago when I had that major crush on MBC. At that time, only Pojie knew about it though I didn't tell him who MBC was and I kept moaning to him on how MBC only thinks of me as an adik, IF he even notices me at all la kan..
One day, we had this data collection at Perda. That night when we came back to the campus, Erwan was involved in an accident with some boys from the nearby estate and it became quite huge when the boys bought in their 'big brothers'. We were tired from the data collection but seeing Erwan in trouble, the whole lot of us sat there with him to support him while the police arrived. While sitting there, feeling a bit bored and tired (It was past midnight and we still had to go to Perda the next morning for a second round of data collection), I was about to doze off when suddenly..
Tadaaaa! MBC came outta the campus. The commotion around us must've caught his attention as he was looking around as he drove outside the gates. Suddenly he turned to me.. and smiled!!! Okay la.. maybe, just maybe, he didn't smile at all pun. Just turned to me je.. but lovestruck me (or more like crush-struck me) was blind to that and insisted on saying he smiled at me.. ape lagi, Pojie la jadik mangse. Ngan excitednye telah carik Pojie untuk bagitau MBC smiled at me haha! And Ayu mule senyum sorang² pastu.. Even when we went to the police station reramai untuk temankan Erwan.. Even when we stayed at the police station until 3am, I was still grinning silly.. Even when I couldn't sleep that night sebab terbayang senyuman MBC (Ecehh.. cheesy!).. Even when we had to wake up at 4.45am to get ready.. Even while sakit kepale amik data sebab tak cukup tido..
And especially when this song was on the radio that morning as I drove to Perda! Ape lagi, semua orang jadik mangse. I had written the lyrics of the first verse of this song on my phone and forwarded it to almost everyone.. walaupun semua orang konpius with the sms and Pojie sorang je paham nape kak Ayu dia jadik gile pagi tu hahah.. and eventhough kene gelak ngan Pojie that morning time breakfast coz I still had the silly grin yang orang lain cam heran je tengok Ayu sengih sensorg pagi tu! So when Izati gave me that song, tetibe teringat balik kisah once upon a crush hehe..
P/S Tadi citer kat abg Fadzil, puas la kene gelak ngan dia. Ade ke dia ckp dia tak sangke I can have a crush on someone sampai camtu sekali. To Pojie: Abg Fadzil kate kat akak, "Sib baik la Pojie layan ja hang dok buat gila camtu kan?" Sib baik le dia tak pecah rahisa time tu heheh..
Satu hari di hari raya..
Iskandar: Ndar nak makan dulu laaa..
Ikram: Nanti orang lain dah siap, dok tunggu dia je..
Iskandar: Kejap la, Ndar nak makan. Kak Yong: Nape tak mandi awal²? Kak Yong: ISKANDAR! Cepat sikit, semua orang dah tunggu..
Iskandar: Kejap, samping Ndar ni..
Izati: Cepat la Iskandar.. dah pukul 9 dah ni! Adi: Kak Yong, orang dah stat la! Kak Yong: Alamak! Betul la, orang dah start.. camne ni? Ikram: Lariiiii.. terus je kak Yong.. JGN BERENTI! Izati: Takkan nak bukak telekung kot..
Kak Yong: Dah la kak Yong drive, gile nak bukak telekung. Izati: Tak pakai tudung kat dalam pulak tu..
Iskandar: JGN BENTI KAK YONG! Terus je!!! Ikram: Pusing kat depan tu.. masuk situ! Kak Yong: Tu jalan ape tu? Ikram & Adi: Betul laaaa!! Kak Yong: Nanti nak cakap ape kat Mama? Adi: Cakap je Imam tu bace laju..
Kak Yong: A'ah.. awal kan arini..
Ikram: Imam tu bace laju giler..
Kesimpulan: Adik beradik ni memang hampeh hahaha.. Oittt, pi mintak maaf kat Imam tu!!! 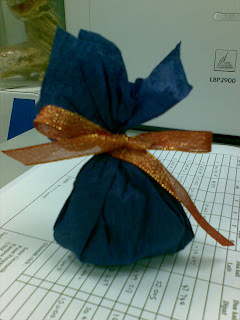 Hmm.. Baizurah requested a raya entry.. tp not really in the mood for it as I didn't have the raya I had in mind. Seriously BORING (with capital letters, as you can see..) All in all, only beraye to.. one (kak Wahid), two (Wan Chik), three (Tok Ah) and four (Pah Nyah) houses.. sib baik la my purple baju raye tak sempat nak siap so on those two days, I only wore my fairly new clothes I've worn only once or twice before. But just because I didn't enjoy my raye, doesn't mean I had a boring break huh.. hehe..
Then rushed back home since I had promised Adi to take him out. Arrived home and was a bit frustrated at something. After praying and having the usual banter with Adi, we went to QBay. Adi wanted to buy something for Abah for raye (Abah was born on the eve of Aidilfitri) but the choices they offered here weren't as much as he had seen in KL. Then Adi looked around for some jeans. There were good offers out there and once again I stress what I had once said last year, shopping with a guy is more tiring.. sib baik la adik sendiri hahah.. The jeans we had liked were outta his size (sehari sebelum raye, jeans pun lawo, mesti la size yg popular dah abis kan) so he bought another one. Went down to buy some takoyaki (Ana la ni ajo Izati, pastu Izati ajo saya.. skrg ni asyik nak beli je :p) and some Brahim spices I wanted to send to Ashraf. Looking at our watches, it was nearly 7pm so we rushed to the musolla for our Asar prayers (Teruk punye Ayu!) then headed to the parking. It was then that we saw this chips shop.. and its not secret that we are crazy for potatoes so we headed there first. 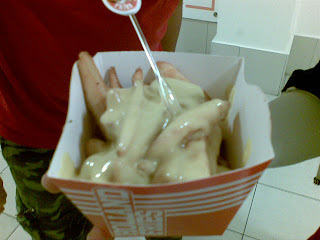 There was this vast choice for the chip so we settled with the honey mustard topping. Initially we wanted to BBQ sauce topping but they were outta it. While waiting, we bought some drinks for iftar and noticed a maybe-not-so-new restaurant there. I had received emails about themed-restaurants in Japan and didn't realize that those kinda restaurants are here now. 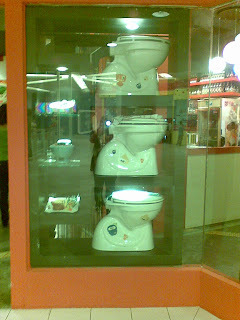 So me and Adi had a good look around at the restaurant hehe..
Then, that night, we went out with Ikram since Ikram also wanted to buy some pants. 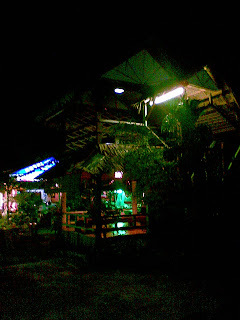 Headed to Sunshine as it was the nearest and since we had got out quite late around 9pm (Promised Ikram after I prayed but me and Adi ended up chatting upstairs and only when we heard Ikram making the Tarzan sound downstairs did we rush to pray while me trying to supress my laughter as Ikram 'berleter' macam mak cik heheh..). Ikram and Adi both bought pants while I bought a t-shirt. Was suprised to see kak Su opis there and found out she lives in Sg Nibong Kecik.. wahh, kecik tul dunia ni heheh.. upenye kakak opisku tinggal 10 minit je dari rumahku selame ini. 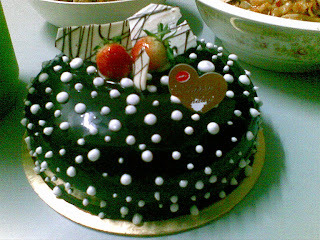 After that we headed to Tanjung Tokong to send Ami's layered cake to her mum's. She's celebrating with her in laws this year so it was up to me to send the cake to my bestfriend's family :) After that our tummies were grumbling. Me and Adi only had the tako and chips for iftar so we shouldn't be suprised, but Ikram also complained of being hungry so off we went back to Sunshine but this time we went to KFC to try out the oven roasted wings and burger since Iskandar said in Penang, only this KFC had the oven menu.. yummy! Sedap giler makan..
Balik tu, Adi ajak gi QBay cari tako heheh. So that was were we headed to after maghrib, raya attire and all. Bought three sets of tako and this potato thingey that was actually like crisps when we were hoping for chips.. kurang la sedapnye but we had a good time at QBay. 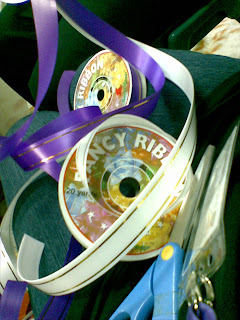 Next day we had our raye which I was soooooo waiting for. First went to Abah's but didn't received any duit raye there hehe.. had a good time with Annisa who ept wanting her brother's book and ignoring the book I bought for her. 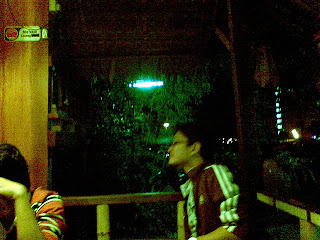 While Irfan decided that he wanted to finish the whole jar of maruku which was quite spicy. 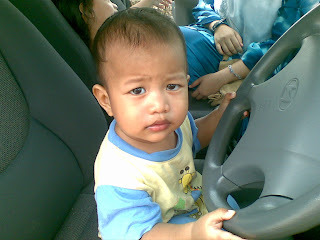 Btw, this is Irfan pretending to drive and being confused on why his Alang (Adi) was taking his picture..
Then we went back to Kuala Kangsar to Wan Chik's. Met abg Sher there and seperti biase la th house jadik bising with all of us nak 'bergaduh' with each other. He had bought his girlfriend along and I'm afraid we must've frightened her hehe.. After going to Tok ah's house, we went to Taiping to Pah Nyah's house before going back to Penang. On Friday, after Jumaat prayers, we (Me, Adi and Izati) went to QBay to catch the Eagle Eye. Good movie, and might make you think twice about technology and artificial intelligence. Then we bought Izati to the chips shop and got hold of the BBQ sauce topping, signature meat topping and wasabi mayo topping.. but our vote still goes with the honey mustard topping. Btw, background itu adelah tangan Ayu memegang chips serta perut boroi Adi sambil Izati ambil gambo mase tunggu lift hehe.. 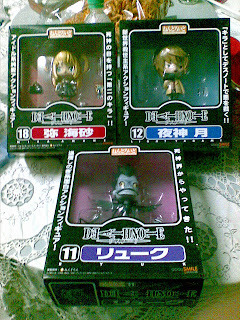 Went to SnJ to buy some cards as my stock was almost 'depleted' and Adi found these figurines of L, Light, Misa and Ryuk. He bough L as it was the cutest woth most parts.. and asked me, "Klau mintak kak misa belikan Misa for me bleh tak?" Cehhhh.. tgh adik saya ni Misa! Heheh..
Lupe plak nak cakap, before going out to QBay, we went to the kedai kain (I will always call this shop by this name.. 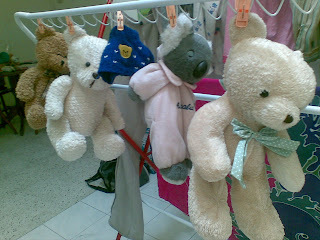 I did all my school uniforms here) coz Adi wanted to 'alter' his jeans while me and Izati went to book the Raspberry Chocolate cake for Adi's early birthday suprise.. So when we arrived home, Izati cooked the koay teow while I prepared the roasted chicken (bought.. not roasted by me laaa..) and bandung ijau (Adi said green is his birthday colour) and tadaaaa.. Adi's early birthday suprise! You can see the book I bought for him which he is holding as well as his L figurine and SnJ frame we got there. 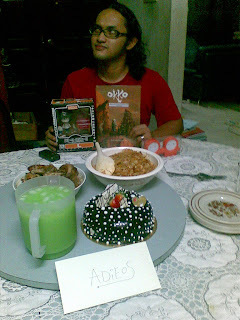 He wanted it to look like he had lots of presents hahah.. jadik la Adi oiiiii!